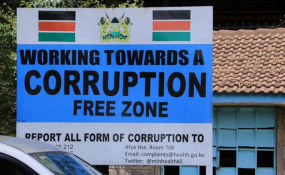 A banner outside the Kenya's Ministry of Health, warning against corruption. TANZANIA has made significant strides in reducing corruption during the three years of President John Magufuli, making it become the second less corrupt nation in the East African region after Rwanda. Speaking to journalists on three years of President Magufuli in power in Dar es Salaam yesterday, government spokesperson, Dr Hassan Abbas, said, among other things, that the strides made included achievements in fighting against corruption. Dr Abbas, who is also the Director of Information Services (Maelezo), pointed out that the East African Corruption Index 2017 mentioned Tanzania as among the countries in the region having a declining level in corruption. He explained that some of the efforts made by the fifth phase government under President Magufuli to combat the corruption were the establishment of a special court to deal with corruption cases. President Magufuli has been living up his promise since he was campaigning for presidency in 2015. The establishment of the Economic, Corruption and Organised Crime Court, Division of the High Court of Tanzania attests to this fact. Dr Abbas disclosed that since the establishment of the court, the number of economic and corruption cases filed before the court between 2017 and 2018 amounted to 384, including 41 new cases and 346 bail and other related applications. High Court Registrar Charles Magesa was quoted last month as saying that 111 of the cases alone were lodged in the Dar es Salaam Registry in the same period. According to him, 294 cases have been determined and the rest are still pending in court at various stages. Efforts made by the government in establishing the court started in July 2016 when President Magufuli endorsed a Bill to become law for the establishment of the High Court's Division to help address corruption problems in the country and speed up the dispensation of justice. Thereafter, the rules governing the court were prepared and published. Such rules indicate how witnesses, who will be called to testify during trial, will be protected and they provide for a procedure on how the cases will be determined by the court. Although in previous administrations primary victims of these anti-corruption operations have been mid- and low-ranking civil servants, the fifth phase government has proved to the contrary. There are number of senior officials both from the civil service and the private sector, who have been arraigned countrywide facing economic sabotage and corruption cases.